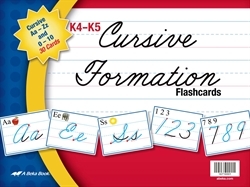 The Cursive Formation Flashcards are used in K4 and K5 to introduce the formation of lowercase and capital letters of the alphabet. You may even want to post the entire series on the wall so that your child can refer to them later while practicing his writing. Also includes 4 cards showing the formation of numbers 1–10.